A Palestinian civilian was wounded in the east of Gaza City, while another was wounded in the east of Bethlehem. Israeli forces conducted 49 incursions into Palestinian communities in the West Bank and 10 ones in occupied Jerusalem. 51 civilians, including 4 children, were arrested. Sixteen of them, including 2 children, were arrested in occupied Jerusalem. Israeli forces continued to target Palestinian fishermen in the Gaza Strip Sea. 6 fishermen were arrested in the northern Gaza Strip and a fishing boat was confiscated. Israeli forces continued their efforts to create Jewish majority in occupied East Jerusalem. Settlement activities continued in the West Bank. Israeli forces demolished 3 dwellings in Fasayel village, north of Jericho, rendering 21 individuals homeless, including 12 children. Israeli forces stopped paving an agricultural road in Jaloud village, southeast of Nablus. Settlers levelled 40 dunums, southeast of Nablus, to expand the borders of “Yesh Kodish” outpost. 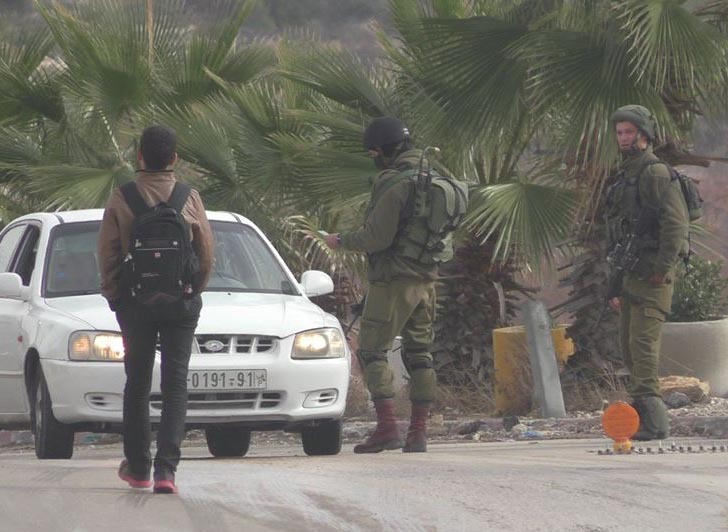 5 Palestinian civilians, including 2 children, were arrested at military checkpoints. A trader was arrested at Beit Hanoun “Erez” crossing in the northern Gaza Strip. Israeli violations of international law and international humanitarian law in the oPt continued during the reporting period (01 – 07 December 2016). Israeli forces have continued to commit crimes, inflicting civilian casualties. They have also continued to use excessive force against Palestinian civilians participating in peaceful protests in the West Bank and Gaza Strip, the majority of whom were youngsters. During the reporting period, Israeli forces wounded 2 Palestinian civilians in the West Bank and Gaza strip. In the West Bank, Israeli forces stationed at Mazmouriyah checkpoint, east of Bethlehem, opened fire at worker Mousa Dababsah (28) from Yata, south of Hebron when he was on his way to his workplace in occupied Jerusalem. as a result, he was wounded with a bullet to the left foot. In the Gaza Strip, in the context of targeting Palestinian fishermen in the sea, on 01 December 2016, Israeli gunboats stationed off Khan Younis Shore in the southern Gaza Strip, heavily opened fire in the vicinity of Palestinian fishing boats within the allowed fishing area. On 04 December 2016, Israeli gunboats stationed offshore, northwest of Beit Lahia in the northern Gaza Strip, opened fire at Palestinian fishing boats. They surrounded a fishing boat manned by two brother namely Shafiq (27) and Sa’adi al-Sultan. The Israeli soldiers ordered them to take off their clothes, jump into the water and swim towards the gunboat. They were then arrested and taken to an unknown destination. Meanwhile, the boat and fishing net were confiscated. On 06 December 2016, in a similar attack, Israeli forces arrested 4 fishermen and confiscated their boat. The four fishermen were identified as Majed Baker (55); his son ‘Omran (32); Mohammed Baker (31) and Khalil (26). On 05 December 2016, Israeli gunboats stationed off Rafah shore in the southern Gaza Strip opened fire at fishing boats sailing in the sea in the morning and afternoon. However, no casualties were reported. During the reporting period, Israeli forces conducted at least 49 military incursions into Palestinian communities in the West Bank and 10 others in occupied Jerusalem and its suburbs. During these incursions, Israeli forces arrested at least 51 Palestinian civilians, including 4 children. Sixteen of them, including 2 children, were arrested in occupied Jerusalem. In the context of house demolitions, on 03 December 2016, Israeli forces forced two brothers namely Sa’id and Naser al-‘Abbasi to self-demolish their houses in Silwan village, south of occupied East Jerusalem’s Old City, upon a decision by the Israeli Municipality Court under the pretext of building on a “Greenland”. The two aforementioned civilians built their houses two and a half years ago on an area of 300 square meters and intended to live in them with their families, comprised of 12 members; half of them are children. On 04 December 2016, Israeli forces prevented paving a 500-meter agircutural road in the eastern side of Jaloud village, southeast of Nablus. The rehabilitation is part of a rehabilitation of agricultural roads project in the areas near settlements. The project is funded by the Italian Civil Volunteer Group (GVC) in cooperation with the international French Relief. On 06 December 2016, Israeli forces demolished 3 dwellings in Central Fasayel village, north of Jericho, rendering 21 individuals homeless, including 12 children. At approximately 02:40, Israeli forces moved into Azoun ‘Etmah village, southeast of Qalqiliyah. They raided and searched 4 houses after which they arrested 5 civilians and took them to an unknown destination. The arrested civilians were identified as Fahed Ali Saleh Fawzi al-Sheikh (30), Mahdi Saleh Fawzi al-Sheikh (34), Alaa’ Ismail al-Sheikh (28) and the two brothers Anas (23) and Abed Jaser Othman Essa (23). Israeli forces claimed that the abovementioned civilians were arrested on grounds of smuggling Palestinian workers to work in Israel via their personal cars. At approximately 03:00, Israeli forces moved into Beit Ummer village, north of Hebron. They raided and searched a house belonging to Bassam Badawi Ekhleil (52) after locking the 10-member family in one room. Later, Israeli forces withdrew from the village, but no arrests were reported. At approximately 07:00, Israeli forces stationed at “Mazmuria” checkpoint adjacent to al-Khas and al-Nu’man villages, east of Bethlehem, opened fire at Mousa Mohammed Dababsah (28) from Yatta, south of Hebron, while going to his work in Jerusalem. As a result, he sustained a live bullet wound to the left foot. Mohammed Awad, Director of Emergency Medical Services in PRCS, said that Mousa was hit with a live bullet to the left foot. He added that the Israeli forces handed him to the PRCS ambulance at the checkpoint, where he received first aid and then transferred to Beit Jala Governmental Hospital to receive medical treatment. His medical condition was classified as stable. At approximately 19:30, Israeli gunboats stationed off Khan Yunis Shore, south of the Gaza strip, heavily opened fire at Palestinian fishing boats sailing within the allowed fishing area. As a result, fishermen were forced to flee for fear of being arrested or wounded, so no casualties were reported. Note: During the aforementioned day, Israeli forces conducted (3) incursions in the following areas and no arrests were reported: Surif, Sa’ir an al-Thaheriyah villages in Hebron. In the early morning, Israeli forces moved into Silwad village, northeast of Ramallah. They raided and searched a number of houses. They arrested Malek Maher Hamed (18), Taher Akram Hamed (18) and Muhanad Abdul Halim Shabrawi (17) and later withdrew taking them to an unknown destination. At approximately 02:30, Israeli forces moved into Beit Ummer village, north of Hebron. They raided and searched 2 houses and then handed summonses to 2 civilians in order to refer to the Israeli Intelligence in “Gush Etzion” settlement complex, south of Bethlehem. The abovementioned civilians were identified as Omer Ahmed Ayad Awad (32) and Mohammed Muhsem al-Za’aqiq (40). They also raided and searched a house belonging to Ibrahim Ali Aqel Ekhleil. They later withdrew from the village, and no arrests were reported. Note: During the aforementioned day, Israeli forces conducted (4) incursions in the following areas and no arrests were reported: Rumanah village, west of Jenin; Ethna and Deir al-‘Asal villages and al-Aroub refugee camp in Hebron. At approximately 01:30, Israeli forces moved into al-‘Aroub refugee camp, north of Hebron. They raided and searched a house belonging to Jaber Abdul Karim (55). They handed him a summons to refer to the Israeli Intelligence services in “Gush Etzion” settlement complex, south of Bethlehem. Note: During the aforementioned day, Israeli forces conducted (3) incursions in the following areas and no arrests were reported: Sa’ir and Kurmah villages in Hebron and Hawarah village, south of Nablus. In the early morning, Israeli forces moved into al-Mazra’ah al-Qebliyah village, northwest of Ramallah. They raided and searched a number of houses. They arrested Mo’men Mohammed Shraiteh (18) and Ali Sufian Buyoud (18) and later withdrew taking them to an unknown destination. At approximately 03:00, Israeli forces moved into al-Aroub refugee camp, north of Hebron. They raided and searched a house belonging to Fathi Zuhdi Muhfouz (19) and then arrested him. At approximately 11:00, Israeli gunboats stationed northwest of al-Wahah shore, northwest of Beit Lahia in the northern Gaza Strip, opened fire at Palestinian fishing boats. Three Israeli large gunboats surrounded a fishing boat belonging to Tawfiq Mustafa Ahmed al-Sultan (41). The boat was manned by the aforementioned civilian’s brothers; Shafiq (27) and Sa’di (31), form al-Salatin neighbourhood. They were sailing within 800 meters offshore. The navy soldiers ordered the fishermen to take off their clothes, jump into the water and swim towards the Israeli gunboat. They arrested the fishermen and confiscated their boat and 10 pieces of fishing net. Note: During the aforementioned day, Israeli forces conducted (4) incursions in the following areas and no arrests were reported: Eskaka village, east of Salfit, al-Samou’ and Bani Na’im villages in Hebron and Azoun village, east of Qalqiliyah . At approximately 02:00, Israeli forces moved into Beit Fajjar village, south of Bethlehem. They raided and searched a house belonging to Saher Nafeth Thawabtah (24) and then arrested him. At approximately 02:30, Israeli forces moved into Jales Mount area, east of Hebron. They raided and searched a number of houses and then arrested Atiyah al- Zaru al-Tamimi (42) and his son Kefah (20). At approximately 09:00, Israeli gunboats stationed off Rafah shore, in the southern Gaza Strip, opened fire at Palestinian fishing boats and chased them. At approximately 17:00, the shooting recurred. As a result, fishermen were forced to flee for fear of being arrested or wounded, so no casualties were reported. At approximately 12:30, Israeli forces moved into Deir Netham village, northwest of Ramallah. The soldiers fired live bullets, sound bombs and tear gas canisters at school students and other civilians. As a result, a number of them suffered tear gas inhalation. It should be noted that the Israeli forces have imposed a closure for two weeks at the entrances to the village and used cement cubes to close them. This was due to the fire broke out in “Halamish” settlement established on the lands of Deir Netham and al-Nabi Saleh villages. Note: During the aforementioned day, Israeli forces conducted (4) incursions in the following areas and no arrests were reported: Rummanah village, west of Jenin; Sa’ir village and al-Aroub refugee camp in Hebron and Azoun village, east of Qalqiliyah. At approximately 01:00, Israeli forces moved into Nablus. They raided and searched several houses and then arrested 4 civilians. The arrested civilians were identified as Sai’d Nabil Dweikat (30), Mohammed Mazen Duiekat (22), ‘Ahed Surhan Duilekat (25) and Muntaser Talal Duiekat (23). Around the same time, Israeli forces moved into al-Dheisheh refugee camp, south of Bethlehem. They raided and searched a house belonging to Abdullah Emad Raqban (24) and then arrested him. At approximately 02:00, Israeli forces moved into Jeet village, northeast of Qalqiliyah. They raided and searched a house belonging to Mohammed Ahmed Abu Baker (26) and then handed him a summons to refer to the Israeli Intelligence Services. At approximately 02:30, they withdrew from the village and no arrests were reported. Around the same time, Israeli forces moved into Dura, south of Hebron, and stationed in Karisah neighbourhood. They raided and searched a house belonging to Rezeq Jubran al-Rajoub (60) and arrested him. It should be noted that the abovementioned civilian was released only a week ago after serving a 23-month administrative detention. At approximately 01:30, Israeli forces move into Aydah refugee camp, north of Bethlehem. They raided and searched a house belonging to Mohammed Saleh al-Kurdi (18) and then arrested him. Around the same time, Israeli forces moved into Hebron and stationed in al-Jeldah neighbourhood. They raided and searched a house belonging to Basel Ali Sukafi (30) and then arrested him. At approximately 02:00, Israeli forces moved into al-Fawar refugee camp, south of Hebron. They raided and searched a house belonging to Rajeh Mahmud Abu ‘Ajamiyah (45) and then arrested him. At approximately 03:00, Israeli forces moved into al-Surrah village, south of Dura, southwest of Hebron, and then stationed at the village entrance leading to al-Thaheriyah village. They raided and searched a house belonging to Sa’id Saqer al-Sha’rawi (43), a Palestinian police officer. They then arrested the aforementioned civilian and his son Ramadan (23) and later withdrew taking them to an unknown destination. At approximately 17:30, Israeli forces move into al-Shurfah area in Taqou’a village, southeast of Bethlehem. They raided and searched a house belonging to Mohammed Khader Sabbah (12) and then arrested him. At approximately 06:00, Israeli gunboats stationed off al-Wahah shore, northwest of Beit Lahia in the northern Gaza Strip, opened fire at Palestinian fishing boats. The gunboats surrounded a fishing boat sailing within 4 nautical miles. It was manned by Majed Fadel Hasan Baker (55); his son ‘Omran (32); Mohammed Ziyad Hasan Baker (31) and Khalil Jawhar Khalil Baker (26), all of them are from al-Shati’ refugee camp. The soldiers ordered the fishermen to take off their clothes, jump into the water and swim towards the Israeli gunboat. The soldiers arrested them and confiscated their boat and fishing nets. Note: During the aforementioned day, Israeli forces conducted (3) incursions in the following areas and no arrests were reported: Sa’ir, Beit Ummer and Karza villages in Hebron. At approximately 00:30, Israeli forces moved into Beit Jala. They raided and searched a house belonging to Amir Khalil ‘Afanah (19) and then arrested him. At approximately 01:00, Israeli forces moved into Sebastia village, northwest of Nablus. They raided and searched houses belonging to Mo’men Nadi ‘Azem (25), Ahmed Jamal ‘Azem (25) and Luqman Ahmed Mohammed al-Sha’er (23). They handed them summonses to refer to the Israeli Intelligence Services. At approximately 01:30, Israeli forces moved into ‘Azoun village, east of Qalqiliyah. They raided and searched a house belonging to Mohammed ‘Ali Rashed Redwan (24) and then arrested him. At approximately 02:00, Israeli forces moved into Marah Rabah village, west of Bethlehem. They raided and searched several houses after which they arrested Mohammed Maher al-Sheikh (20), Mahmud Ahmed al-Sheikh (22) and Mohammed Ahmed al-Sheikh (21). At approximately 03:00, Israeli forces moved into Bethlehem and stationed on al-Saf Street in the central city. They raided and searched a house belonging to former prisoner Saleh Walid al-Harimi (20). They then handed him a summons to refer to the Israeli Intelligence Services in “Gush Etzion” settlement complex, south of the city. Note: During the aforementioned day, Israeli forces conducted (3) incursions in the following areas and no arrests were reported: Ethna and al-Shyoukh villages in Hebron and Tal village in Nablus. Following the Friday prayer on Friday, 02 December 2016, dozens of Palestinian civilians and Israeli and international human rights defenders organized demonstrations in Bil’in and Ni’lin villages, west of Ramallah; al-Nabi Saleh village, northwest of the city and Kafer Qadoum village, northeast of Qalqiliyah, protesting against the annexation wall and settlement activities. Israeli forces forcibly dispersed the protests, firing live and metal bullets, tear gas canisters and sound bombs. They also chased the protesters into olive fields and houses. As a result, many of the protesters suffered tear gas inhalation while others sustained bruises as Israeli soldiers beat them up. At approximately 15:15 on Saturday, 03 December 2016, a similar demonstration was organized in Kafer Qadoum village, but no arrests were reported. At approximately 15:00 on Friday, 02 December 2016, Israeli forces stationed at the border fence between the Gaza Strip and Israel, east of al-Shuja’iya, east of Gaza City, fired live bullets and rubber-coated metal bullets at Palestinian young men, who were on their way to Nahal ‘Oz area, east of al-Shuja’iya, participating in activities held in solidarity with Jerusalem. As a result, Talal Nabil Ali Abu Namous (19) sustained a live bullet wound to the head. Moreover, due to the continuous shooting, civilians, who were in the area, were not able to transfer the wounded civilian and he was left bleeding. After half an hour, a PRCS ambulance transferred him to al-Shifa Hospital in Gaza to receive medical treatment. Medical sources classified his condition as moderate.